Erin Beers from Mrs. 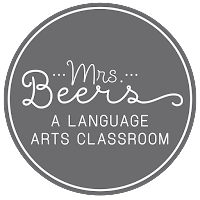 Beers' Language Arts Classroom here, and I am thrilled to be guest blogging at Fifth in the Middle today! I am a 6th grade language arts and reading teacher. As you prepare your upper elementary classroom and begin your planning, I wanted to share some ideas for implementing the Daily 5 into your teaching. The Daily 5 turned Daily 4 was a huge undertaking in my 6th grade classroom, so I wanted to share some tips and tricks as you begin the year in your upper elementary classroom. My focus for my 110 minutes of instructional time is word work, writing, read to someone, and read to self. Before you get the idea that all of these tasks were happening each and every day and in seamless fashion, don't fret, they weren't! I realized that each had a place and I needed to find that spot in the day/week in order to make the schedule work for my students, the demands of testing, and the expectation of administration. Here is how it worked best for my students and me. Word Work was the easiest component to incorporate because I begin every day/class with a morning starter/bell ringer. Three different tools for this are: Word of the Day, Boggle, and the spelling component from Reading Street. A huge weakness for my students is vocabulary, therefore having it in three different formats has proven invaluable. The BOGGLE Board was an enrichment activity that students could work on any time they finished classroom work. I change the letters on the board weekly, they could grab a new sheet from the board, and turn in on Friday. Some of my students AMAZED me with the words they found. For those that love puzzles and word searches, this is a classroom must-have. My Word of the Day resource is something I created to meet the needs of my students. I was unable to find a vocabulary resource that I could utilize in only minutes per day. 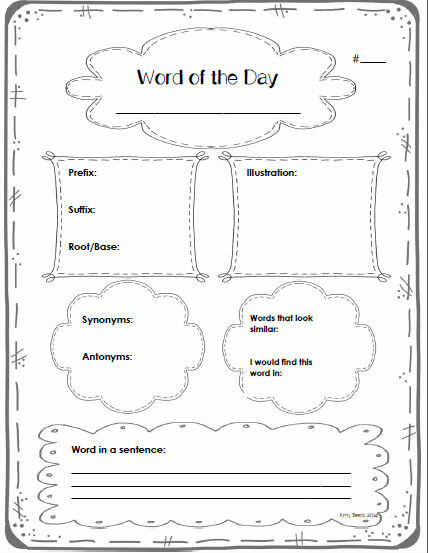 In addition, my students STRUGGLE with identifying synonyms, antonyms, prefixes, suffixes, and roots, so this was created to enhance their understanding. Twice a week the word would be posted on the MIMIO or Smart board, and my students record the definition, identify any synonyms, antonyms, affixes, create a picture of the word, and use it in a sentence. 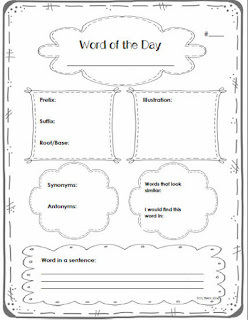 Word of the Day organizer for daily student word work in minutes a day. The spelling component of Reading Street is my other word work source. On Monday we would go over the rule of the list, define the words using context clues as a whole class, and my students write the words 5X each. That may sound a bit dated, but the only practice my students get with these words is in the classroom. Studying at home is a challenge for the majority, so I need to make sure their understanding and grasping of words truly takes place in the classroom. On Tuesday, Wednesday, and Thursday we will do different word games and activities with the spelling list words, so that by Friday, spelling test day, they are prepared, and can not only spell the words correctly, but incorporate them into their writing pieces and written responses. A fast-paced game of spelling word concentration in action! Writing is done in multiple ways in my upper elementary classroom through written responses to reading, Photo of the Day writing, end of novel projects, and general writing instruction. 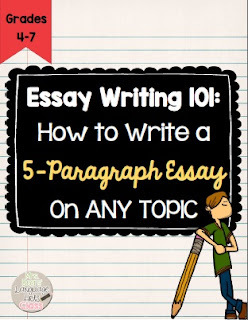 This tool is an example of how I teach essay writing. Click the image to download this FREEBIE. I try to engage my students in writing as often as possible with high-interest topics and prompts, but they need continuous work organizing their thoughts and articulating them clearly on paper. Read to Someone is done daily in my classroom. One method is through partner reading novels or mentor texts, but another tool I utilize is a modified version of 6-Minute Solutions, which is a fluency tool that is a necessity for 90% of my 6th graders. Because students at the 6th grade level should be reading grade level text at a rate of 120-150 per correct per minute, and many of my students are not quite there, I have to incorporate fluency practice into my instructional time. Here is how it works: I pair up students based on their fluency rates, each student is given a reading passage at their current reading level that is marked with the number of words. Before the first person reads, the students exchange texts, the student on the left (the stronger reader) always reads first for one minute, which I time, data is recorded (number of words read in the minute minus any miscues), and then repeat with the reader on the right. The passage is read Monday-Friday with a fluency partner, and then on Friday, I progress monitor each student for the 6th read. I keep this data in order to keep students, parents, and administrators aware of student progress. If you are looking for a tool to enhance speed of reading, this is a great one. Read to Self is another daily component. We are always reading a novel or navigating a reading selection to enhance our knowledge of reading literature or informational text. While I will instruct or work with reading groups for a period of time each day, students will also be given designated time for read to self. I can't say it is a period that we build stamina for, instead it is a time students are allotted daily. When they have completed reading that is assigned during class, my students have the opportunity to read their library books or magazines, books, or other texts from around the classroom. I would love to hear how you manage these components in your upper elementary classroom. Daily 3 was the first period of a block class and the next period was lessons. We had this time every day unless it was cancelled due to a novel study/project. During this time, I would conference with students on their writing and independent reading novels. Towards the end of the week and gave a grade using a rubric for their overall daily 3 effort for the week. This upcoming year I have to incorporate a new literature textbook (we've never had one!!) in addition to teaching concepts and using novels. I think I might do small group lessons using the textbooks during Daily 3 time. What do you think? Also, do you sit with students while they read to someone? Do they all do this at the same time or do you pull two at a time to the side? That is really good to see some information about Word Work for older kids! I do Daily 5 with my 5th graders and they love Boggle! I will definitely try your idea and put the letters on the wall. Thanks for sharing your practice! Could you give me more clarification on the 6 minute solution process. If students have different texts at different levels why do they switch texts? Great question. They have to swap texts so that the listener can follow what the reader is reading and chart the reader's progress. They must circle miscues and mark where the reader gets at the end of the minute. I found it really hard for both students to work with just one passage. Feel free to email me if I can answer any more questions. How do your students do the BOGGLE? Do they just search for words? 1. I print out the letters. 3. Back all letters with Velcro and Velcro spots on the board where you are placing them for easy placement and removal. If you are using a bulletin board, stapling works as well. 4. Place letters in 4 rows and 4 columns using random letters. 5. Model for students how they can make words. 6. Print out Boggle Board Words page and pass it out to students. They can complete it as morning work or when they have word work time in your class. 7. Let the word finding begin. I love your ideas, especially the idea of fluency practice being the read to someone component- it's two birds with one stone. I wanted to share my solution to this book box in my 4th grade classes. I have three sections of 25-33 students each, so there is definitely no way to keep 10 books per kid in separate boxes. I have each student select 4 books to keep with them in their school bag at all times. I feel like that amount is manageable for them in lieu of a textbook to carry, and provides choice and longevity for their independent reading options. Many of my students do not have reading material at home, so it's important me that they have books with them other classes and at home. The downfall to this approach is that books sometimes disappear as every student takes them home. I utilize scholastic points very strategically to keep my library full and fresh, so that helps balance the loss. -It reverses and the other kid reads theirs. Do they each read for 1 minute only? Then the recorder counts the numbers of words read? Do they have to hit a certain amount of words in order to move up? Hi Erin. I am still confused by your fluency practice. Can you create a list of the specific steps you take? Also, where do you get these texts? Where do you get your word of the day? Does it relate to any certain story or book you're reading? Do you choose words from a spelling list, site word list, or vocabulary list? I also teach SS, so I was considering words from there as well. What are your thoughts on that idea? Thanks! The students look really engaged in the photo. What are students doing in the face paced spelling concentration game?